beware: these little beans may be low-maintenance, but they will steal the spotlight if served with anything short of spectacular. simmer two cans of black beans in a saucepan. you could use fresh beans, but when your roommate disappears to Costco for an afternoon and returns with several pallets of legumes, you’ll want to take the easy route. roughly chop a handful of cilantro and add to the pot. 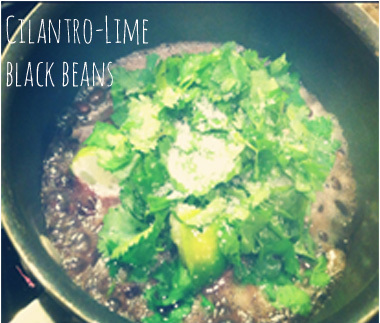 quarter two juicy limes, squeeze them into the beans, and add a couple quarters to the pot. season with salt, pepper & cumin. and then forget about them. five minutes before serving, if needed, i’ll add a cup of veggie stock to get them happy again. perfectly simple, protein-rich, and happy on the back burner. those are our kind of beans!